Radway Meadows Nature Reserve is managed by the Warwickshire Wildlife Trust and the Church2Church Walk from St. Peter’s Church in Radway to the Assumption of the Blessed Mary Church in Middle Tysoe crosses the area. The two meadows and stream which are to be found in King John’s Lane are bordered by ancient hedgerows. The hedges may be 400 years old with a mix of Oak, Ash, English Elm and Pear. Lower Tysoe stands slightly detached from Middle and Upper Tysoe and has no pre-17th century buildings, although it is much older as a settlement and was once held by the Templars of Balsall. During this period the village was named Temple Tysoe. Tysoe is the name given to Middle and Upper Tysoe now that they have merged. Tysoe covers an area from the flat agricultural landscape of the Vale of the Red Horse and rises steeply up to the Edgehill escarpement. The Vale takes its name from the large Red Horse of Tysoe which was once cut into the red ironstone soil of Edgehill and which was recorded as early as 1607, but which is now lost. The Doomsday Survey maintains a priest at Tysoe, indicating that there was a Church here in 1086. The current parish church is dedicated to St. Mary the Assumption and dates back to the 11th century and is a fine Norman church with some Saxon features. In the churchyard is a 15th century preaching cross rather more complete than usual. It has a 4ft 3” square shaft with small edgerolls and moulded capitals. On it is the damaged tower of a Cruxcifixion. The base is octagonal, changing to square in the lower half, and it is set on two steps of octagonal plan. The other place of worship in Tysoe is the Tysoe Methodist Church which was officially opened on 17th October 1970. Today, members enjoy a modern and comfortable church for worship and social events and it is situated on the Main Street. Methodism in Tysoe goes back to the life and time of John Wesley with cottage meetings. In 1793 two members purchased adjoining properties and a barn which became the new chapel and served the village for the next 149 years. Two areas of the village contain several pre-17th century buildings. There is the area south of the church and includes The Vicarage and then there is the area along Shipston Road that includes the 14th century Manor House. The local primary school was opened in 1859 and has been extended in both the 1980’s and 2005. Residents of Tysoe benefit from having a Village Hall, a public house named Peacock Inn and the combined Tysoe Village Shop and Tea Room, all of which are to be found on the Main Street. The war memorial is on the corner of Main Street and Back Lane. Joseph Ashby, the agricultural trade unionist, was born in the village in 1859. Tysoe Island is a small nature reserve of meadow and woodland and is managed by Warwickshire Wildlife Trust. It is to be found on Shipston Road, on the right and opposite the pedestrian gate of the footpath leading up towards Tysoe Windmill. House and estate owned by the Compton family. There is a fine view over to Compton Wynyates and the Church from the windmill. 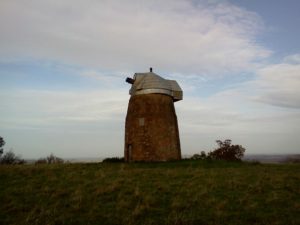 The windmill was built in the early 18th century and the structure is a 12 sided, barrel shaped stone tower with batter. The conical cap is covered in aluminium with a finial and tail projection for winding gear, two stones, and the windmill still contains all its machinery. The mill operated until 1915 when it was struck by lightening. Recently the sails and stocks were removed for safety reasons. Winderton was originally an Anglo-Saxon settlement and ownership of the village has passed through the hands of several feudal magnates. The village today is a cluster of houses and farms, the oldest dating from the 17th century and which are all grouped together on a sheltered site. 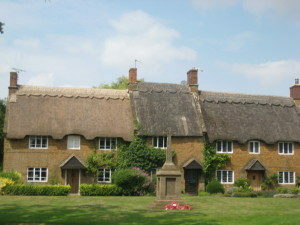 Some of the houses are still thatched and almost unchanged since 1878. From the elevated position of the village there are magnificent views across the lush ‘Feldon’ towards Brailes. Without doubt, the most notable feature at Winderton is the Victorian Church of St. Peter and St. Paul, which was made redundant by the Church Commissioners in 1976. This church is a beautiful edifice of the Early English style and was erected in 1878 by Reverend Canon Thoyts, as a memorial to his parents, on a site given by the 4th Marquess of Northampton. Brailes is often referred to as one village but in fact it includes two, Lower and Upper Brailes, and both are within the Cotswold Area of Outstanding Natural Beauty. The two villages are surrounded by hills and Upper Brailes is on the side of Brailes Hill, which at 760ft above sea level is the second-highest point in Warwickshire. The group of Beech trees on the summit makes it a very distinctive landmark. of St. George. This is a very large parish church and is out of proportion to the current size of the village and indicates the former importance of Brailes. In fact it is known locally as ‘the Cathedral of the Feldon’. Feldon is an old English word meaning ‘the land from which the timber has been cleared away’. St. George’s Church is Grade 1 Listed and the bell tower is some 120ft high and has the third-heaviest ring of six bells in England. The bells are still regularly rung and campanologists come to experience the unique sway of the tower when the peal goes full swing. The village war memorial is outside the main gates, on the approach to the church. There are two other places of worship in Brailes. The Roman Catholic Chapel of St. Peter and St. Paul is in Friars Lane and the redundant Primitive Methodist Chapel is to be found at Upper Brailes. The Manor House in Friars Lane was built early in the 17th century and was the birthplace of William Bishop, the first Roman Catholic bishop in England after the Reformation. In 1726 the Bishop family added a range of buildings that includes the Roman Catholic Chapel on the upper floor. The Manor House and the chapel are both Grade 2 Listed Buildings. week by Girl Guides, Brownies and Playgroups while the kitchen was used by the local ‘Meals on Wheels’ service. Castle Hill Motte in the middle of the village is a natural knoll that was made higher in the Norman era to form the motte of a motte-and-bailey castle. Its construction may have been ordered by the Earl of Warwick (1123 – 53). Earthworks of both the motte and the bailey survive and the site is a Scheduled Monument. Two other notable properties in the village are The Old Parsonage, alongside the entrance to the Church of St. George, and Brailes House which was the former home of the Sheldon Family who were wealthy landowners in the area at the time. In Lower Brailes there are three old school buildings, The Free School, The Old School and a third building next to the churchyard in Friars Lane. The Old School building has now been converted into a home, having been superseded in 1960 by the current Brailes Primary School. The Free School building houses the mechanical and craft society and the building next to the churchyard is used by the community. Brailes has two public houses. The George in Lower Brailes is a traditional inn that is typically found in England with an inglenook fireplace, stone mullioned windows and some historic panels. There is even a suit of armour in the corner which is known as George. The inn dates back before 1350 when the stonemasons who built the church opposite were housed there. 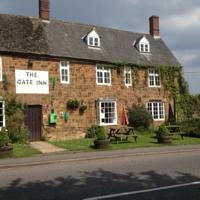 The Gate Inn at Upper Brailes is a traditional 16th century Cotswold type public house where walkers are very welcomed and like to visit. The residents of Brailes benefit from the services of the Brailes Village Stores, a local butcher and a newsagents shop, together with having the spacious Brailes Village Hall, which has a large car park and can be used by visitors.